Tbilisi, DFWatch – In the wake of release of new wiretapped telephone conversations on Monday, Georgia’s former president makes his first comment denouncing the recordings as ‘doctored’ by the Russian intelligence. “These calls have been intercepted and doctored by the Russian intelligence agency and posted on the website known to be controlled by them,” Mikheil Saakashvili wrote in his Facebook post on Monday, pledging not to resort to the violent means ever. “Our fight shall remain peaceful at all times, but we shall organize, have united front and prevent carrying out of the Putin style crackdown on media and on existing democratic institutions,” Saakashvili writes, referring to the ongoing litigation over Rustavi 2 ownership. The authenticity of the audio recording has been denied also by Nika Gvaramia, Rustavi 2 TV CEO. Although acknowledging his voice was real, he said he didn’t remember such kind of conversations. Earlier, on Friday, he confirmed the authenticity of audio tape published the same day. Giga Bokeria, Saakashvili’s key political ally in Georgia and one of the participants of the recording, also confirmed authenticity of another recording published also on Friday, stating he didn’t view it as being something extraordinary. Two new wiretapped recording have been published on Monday on the same Ukrainian website. In the first one, Saakashvili converses again with Nika Gvaramia. The two allegedly discuss scenario of resistance against law enforcers in the case if Rustavi 2 current owners loose the litigation in the court. Gvaramia asks whether it is possible to seek help from the former head of Saakashvili’s personal guards, Temur Tanashia, to put up resistance. Saakashvili supposes it would be better to mobilize former members of the riot police and suggests ‘Givi’ (Givi Targamadze, former MP and prominent member of the United National Movement) as a middleman. 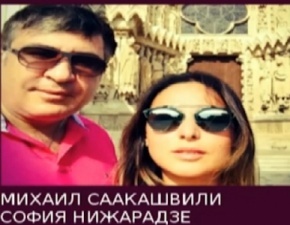 In the second recording, Saakashvili talks allegedly with Sopho Nizharadze, a popular Georgian pop singer and a friend of him. Georgia’s former president, who currently serves as a governor of Ukraine’s important Odessa region, says in the friendly chat that “there will be a bloodshed” in Georgia and asks her to be ready. Sopho Nizharadze also commented on the recording. “I think it is total nonsense to comment on the forgery by the FSB,” Sopho Nizharadze posted on her Facebook referring to the Federal Security Service of Russia, whose Russian abbreviation is FSB. She added to be summoned to the Georgian State Security Service for questioning on Tuesday noon. Temur Janashia, Saakashvili’s former chief personal guard, also was summoned to the security agency for questioning. On October 24 the Agency started investigation over alleged state coup attempt. The statement reads the investigation has been opened based on operative information available to the Agency’s Counter-Intelligence Department and news spread by the media.